*New Lower Bulk Pricing. Sold in multiples of 1 lb. bags, NOT one big container. Buy more and save! Questions? Email or Messenger me for quick answers! **Working With & Retraining Ex-Racehorses. **Training & Handling “Hot” & Nervous Horses. **Calming & Rehabilitating Rescued Horses. **Starting Colts and introducing Green Horses to new situations. **Desensitizing Horses – you’d be surprised how many horses and people get hurt doing this! **Working with extremely Head Shy Horses. **Training Horses to go into a Trailer. **Relaxing Horses for Shoeing & Trimming. Shoeing a relaxed horse is essential for the safety of the Farrier and the comfort of the horse, especially with a green or spooky horse. **Body Clipping & Mane Pulling. **Wrapping Legs – especially with touchy horses. **Calming Horses when moved to a new home or boarding facility. **Trailering your horse short or long distances. **Grieving the loss of their buddy. **Quieting Horses on Stall Rest. **Quieting Horses returning to exercise after Rehabbing Injuries. **Relaxing Tight Muscles especially when returning to training after a layoff. **Trail Riding! There’s nothing better than riding a calm trail horse. **4H and Gymkhana Events – lets keep it safe for the kids! **Non USEF Horse Shows & Schooling Shows. **Relaxing Rope Horses in and out of the box. **Same goes for Team Penners! **Barrel Racing – especially for Arena Sour Horses. The list can go on and on but I think you get the picture! The good news is that Ultra Calm Equine can help and you no longer have to put up with these problems anymore. If your horse is being trained or acting out on a regular basis, then it would be best to dose him daily until his behavior improves and he calms down. If he only acts up in certain situations like trail riding, shoeing, or going places, then just dose him an hour before you leave or have to work with him. Ultra Calm Equine mixes easily with any pelleted feed or bran. Please note that all suggested equine dosages are based on the average 1,000 lb. horse. Ingredients: A proprietary powdered blend of Premium Quality Valerian Root & Extract for optimal results! *Please note that valerian will test in USEF & FEI shows because it is considered a performance enhancer! Check with your association for their rules regarding this and how soon you need to pull it from your horse’s diet before you show so it won’t test through. Do not feed to a pregnant or nursing mare. 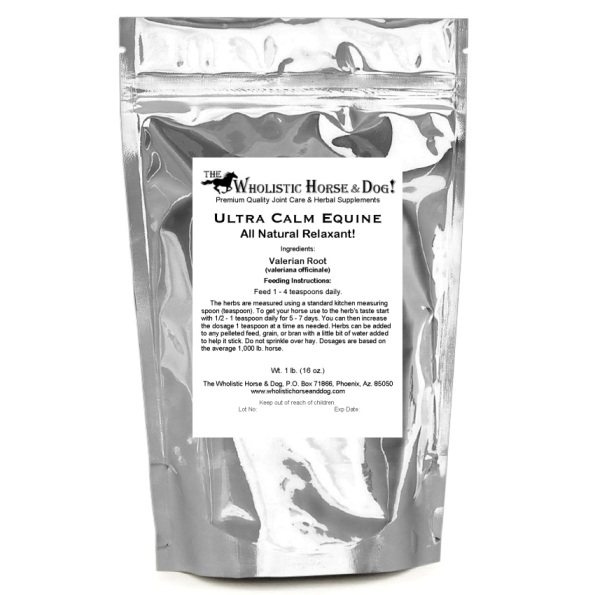 The “Calm, Cool, & Collected Bundle” helps Maximize Focus, Comfort, and Ability for both Pleasure and Performance Horses! 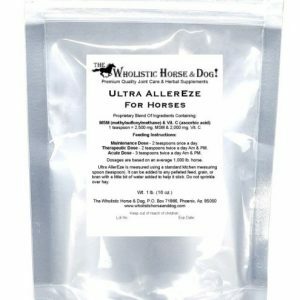 Ultra AllerEze For Horses provides Relief for the symptoms of Seasonal Allergies & Skin Problems and Boosts the Immune System for horses Under Stress from an Illness, their Environment, Traveling, etc. It is available in a 1 lb. bag. The “Sea Minerals Plus Bundle” provides Optimal Nutrition while Maximizing Comfort and Performance! You get 1 half lb. bag of Ultra Sea Minerals and 1 half lb. bag of Ultra Flex GS Plus for Horses. Ultra IntestinEze™ is a Premium Quality Herbal Supplement for Better Intestinal Health in Horses! It comes in a 1 lb. bag and will last about three months when fed daily. The “Working Girl Bundle” helps Balance Moods while Maximizing Comfort and Performance! Plus...Get A Coupon For 10% Off Your First Order! Follow us for Product Sales, Exclusive Specials, and New Product Info! © 2019 Wholistic Horse and Dog. All Rights Reserved. Please note that the information given on this website is not intended to diagnose, treat, cure, or prevent disease and should not be used as a replacement for proper veterinarian care.